The split glass door consists of two glass-boards which are joint together with small, discreet hinges. In this way, by pulling the door out, the two panes fold up and are pulled aside so that they don’t take up a lot of space. The glazing, 10mm thick, is clamped and held by an aluminum profile at the top end of the device. 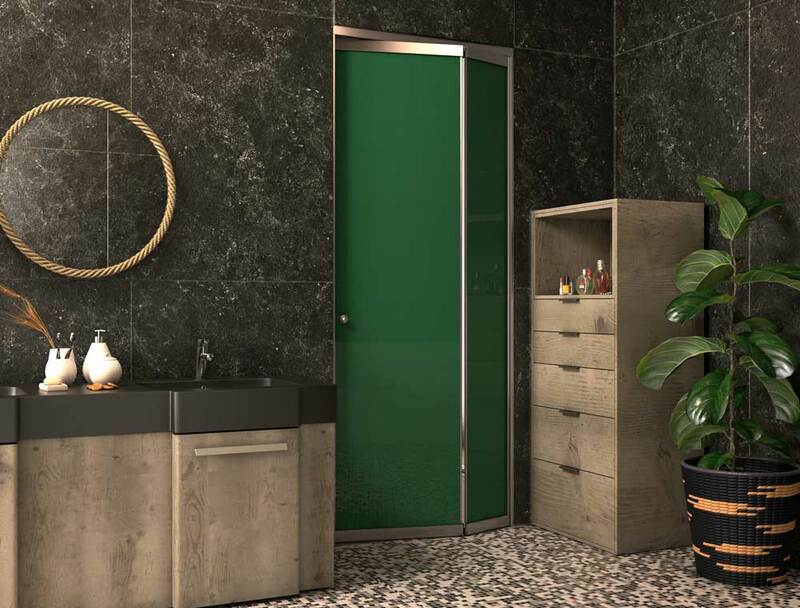 The split glass door system is an ideal solution for small, limited spaces, such as bathrooms, or WCs. Because of the flexibility of their design, they facilitate the architectural design of spaces, offering an exceptional solution to setting up a space at home, hotel, gym, and wherever else there is a need for a smart, glazed entrance. Design flexibility: The split glass door offers a lot of flexibility to freely design spaces without limitations. Contemporary design: The design perfectly matches a contemporary, industrial style, in tune with all other products offered by our company, in case they too are installed in the same space.